Aigle Parcours Wellingtons: The Perfect Choice this Winter. This winter a sturdy pair of wellingtons is essential footwear to get you out and about on your country walks. If you find that your wellingtons restrict you from walking the long distances you planned, or interrupts the intensity of your hunting expeditions, then look no further than a pair of Aigle’s Parcours wellington boots with Anti-Fatigue soles. 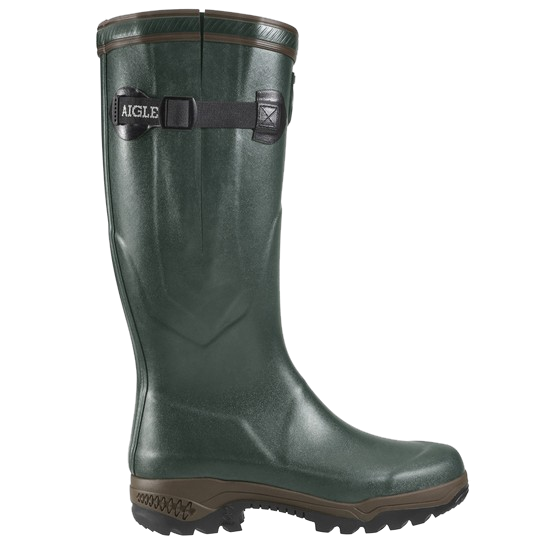 Celebrating 20 years since their release, Aigle’s range of Parcours wellingtons are designed primarily for hunting; optimising performance with its triple density rubber sole. Protecting the feet from fatigue a pair of Parcours wellingtons is a long lasting and worthwhile investment to see you through many years of country walks and memorable expeditions. Here at Ken Varey’s we recommended three of Aigle’ eleven Parcours wellingtons, all anti fatigue but each made for different terrain and weather. The Parcours 2 is the entry level wellington ideal for those seeking durable and long lasting wellingtons that will keep their walks lasting longer. It’s thanks to the wellington’s triple density sole that the wearer is given comfort and stability. Within the heel is a dual purpose dampening cushion. Absorbing the impact of the walker’s steps, it uses that energy to propel the heel, acting as a spring to help the walker into their next steps. The midsole adds comfort and stability with its support, whilst the abrasion resistant outer sole adds balance with its strong grip on the ground. Insulated with 4.5 mm thick neoprene lining, a pair of Parcours 2 ISO wellingtons will insulate you from the cold down to - 20°C. Its lining contains micro bubbles of air which improves insulation for the feet and legs, keeping them warm and going alongside the wellingtons’ triple density sole. 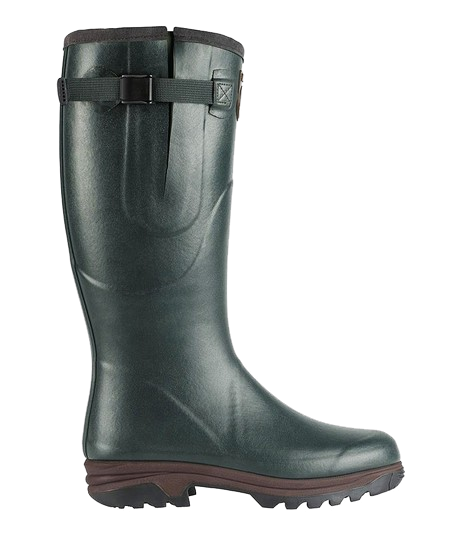 Comfort is given by its waterproof adjustable gussets; adding comfort without compromising the wellington’s design. Parcours 2 Outlast – The Temperature Regulating Wellington. The outlast is perfect in regulating temperature, making it an ideal pair of wellingtons to keep you warm when stationary, whether you are admiring a view on a Winter’s walk or waiting intently for your next hunt. It is down to the materials used within the wellington’s lining that temperature is regulated, they absorb excess body heat and retain it until it releases it when needed to maintain temperature within the Wellington boot. 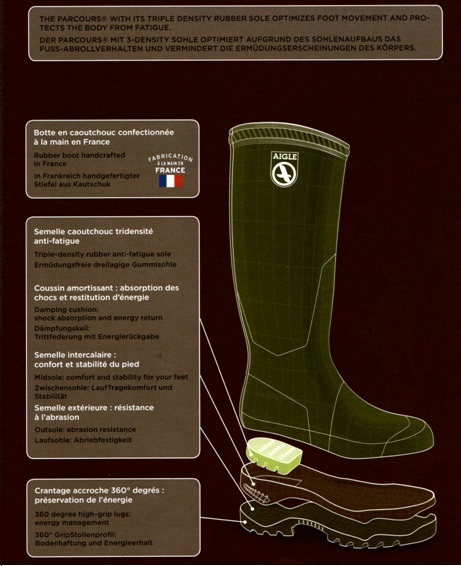 As a product of two years of research and development, the Parcours wellington is a technical and practical marvel of wellingtons, its capacity to absorb energy that’s twice as much as the European standard has made it a winner amongst a European panel of farmers, hunters and envi­ron­men­talists. Get your pair of Parcours Wellingtons from Ken Varey’s town and country wear; take a look on our website.